Hi! I’m Nick and I’m going to be giving you some expert tips on how to maneuver, spin, do amazingly tight u-turns and reverse at break-neck speed. First of all, please don’t be put off by the apparent difficulty of these maneuvers – you’ll be amazed how easy some of these tricky moves are to execute once you’ve been in power for a bit. A bit of practice and I promise you, just like me you will be able to expertly turn, twist and spin your policies so fast that the strong smell of principles burning can be detected everywhere. I can assure you after very little time in power it will become second nature to you to spin, do u-turns and be just as evasive as I am. In first gear bring yourself up to around 3500 revs, put your left hand on the steering wheel and suddenly spin your previous promises all the way around from nine o’clock to six o’clock – just in time to catch the evening news bulletins. As soon as you begin to make your u-turn – pull the handbrake on your policy. Then correct any oversteer that occurs to ease the pressure that may have built up from your supporters as a result of your sudden about-turn. Classic ‘doughnuts’ are for showoffs – like me – and are best performed in a party which is mainly driven from the rear – like the Liberal Democrats. 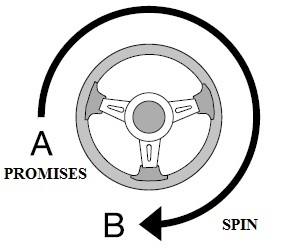 This is where you slide your policies round and round in tight circles so that all your principles begin to swivel around a circular central point and you end up not going anywhere fast. Please remember though that if this maneuver is performed too often, it can do terrible damage to your elected representatives and it also tends to leave smoking tracks behind you which could attract a lot of negative media attention! Step 1. From a standing start select your gear – for example simple shirt sleeves and jeans which hopefully will make you look more in touch than you are. Step 2. Lock the party policy over in the direction of spin you want to go in. Away you go. Simple, perfectly spun circular policies every time. If you’re attacking it from a rolling start you can simply squeeze on the handbrake before you even begin thereby locking your party into a never-ending spin of lies and disinformation. 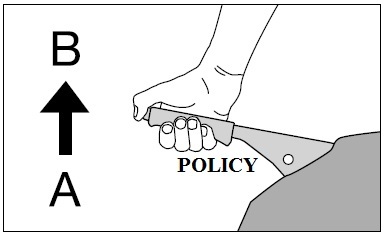 First of all you need to find an empty space devoid of original ideas in which to park your policy – preferably positioned between two other stationary policies put into place by other parties. To do this you’ll need to find a suitable empty gap in your policies. In my case that’s pretty easy to do. Approach from approximately 50 days away – it all depends how fast your election campaign is proceeding – and keep the place for parking your new policy on your far-right (or on the left if you’re aiming to be in coalition with Labour). You can also approach from any other direction – all that matters is you don’t end up colliding with the other policies already in place which might damage your chances of getting a seat in the cabinet during the maneuver. Just reverse your hands on the steering wheel, start at three o’clock and turn your morals completely around – parking your policy in the empty space before any one else gets in before you. That’s it. Simple and effective. Easily the most desirable skill to have is the power slide. It’s the one move that really gets your heart pumping and turns heads whether you’re a Deputy Prime Minister, a minister or even just a leader of a 2-bit party like me about to be voted out of power and keen to try out your getaway skills. The idea is to keep your election campaign moving at a constant speed while navigating a sharp turn to the left or the right ahead. To do this you break traction by applying the brakes on all your policies just before taking a sharp turn to the left or right – in the opposite direction that was expected. You then reapply acceleration so that your policies appear to be travelling in a different direction from the one you’re actually going in, usually sideways. One word of caution – if you don’t apply enough acceleration during a coalition, you will simply start to move too slowly. If you do this too often without regaining traction – that’s called drifting. That’s it for now. Happy spinning! Another one of the satirical metaphors in which Mr Pride does so well. In this case, it’s Nick Clegg’s policy U turns and absolute abandonment of principles when convenient, treated as a driving manual. This is particularly fitting, as Clegg is young, flash and very glib, and you can imagine him very easily as one of the young bucks, who ostentatiously drive around in their top of the range cars with the window rolled down so you can hear their taste in music. Most often, it’s rap, but in the case of Clegg and the Lib Dems, it’d probably be something more mainstream, as rap with ghetto vibes might put off the staid middle classes. It certainly doesn’t take much imagination to get the impression that Clegg and his crew are the types, who stand around boasting about their cars and how much it all cost them, but that last year thanks to flash financial deals they trousered so many £K. So this just about describes Clegg: All display put on to impress, but with no substance, and nothing approaching genuine morals or an understanding of how the rest of us live. If Clegg offers us a lift, my recommendation is that we should all choose to go by public transport. Or walk. It might take longer, but it’s safer, and it leaves your morals and sense of self worth intact. A good piece of satire from Tom Pride. Enjoy!!! However, I do love a well-worked elaborated metaphor. Lib Dems Pensions Minister Mr Steve Webb has been in charge of wiping out the state pension for huge numbers of men and women on and from 6 April 2016. Mr Webb did say in the press that he was unconcerned what people THOUGHT they were going to get in state pension … from the flat rate state pension 2016. The SERPS opt out and various pension changes that are within the Pension Bill 2014 (flat rate pension 2016) means now the starving will be added to by pensioners who face WORK TIL YOU DIE or STARVE IF YOU CAN’T forever in old age.